Infections – certain parasites, bacterial and viral infections have been found in the endometrium of women with endometriosis, leading researchers to consider these infections as new factor in the establishment of endometriosis. Intestinal permeability (leaky gut) – this is when microscopic holes in the lining of the gastrointestinal tract, caused by poor diet, environmental toxins and antibiotics, allow bacteria and food molecules to enter your blood steam triggering both an immune and inflammatory response in the body which can contribute to endometriosis. Unfortunately diagnosing endometrioses is not easy. 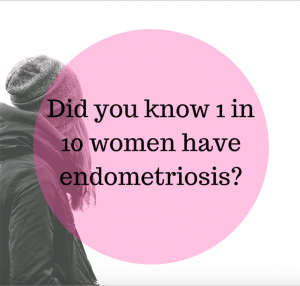 Some women do not show any of the signs and symptoms, so they have no idea they have endometriosis until they have trouble conceiving. You can have a pelvic/transvaginal ultrasound, however this method does rely heavily on the skills of the technician and can sometimes be missed. The only way of truly diagnosing endometriosis is via laparoscopy. Reduce overall inflammation in the body with diet and supplements (see tips to reducing inflammation handout) as well as correcting methylation pathways (important for patient’s with MTHFR) as you cannot control inflammation in the body if your methylation pathways are blocked. Restore a leaky gut – one of the symptoms of leaky gut is brain fog as toxins are getting through the gut lining up into the brain. If you have had a poor diet (lots of gluten, sugar, fried foods) or have taken a lot of antibiotics, you most likely have a leaky gut. Treatment for leaky gut incudes restoring the lining with nutrients such as glutamine, zinc, vitamin A and vitamin D.
Reducing excess oestrogens – this includes supporting liver detoxification pathways with supplements such as DIM and calcium-d-glucurate. Women with the MTHFR gene mutation need to ensure the methylation pathways are supported so that they can clear estrogen effectively via the liver. Histamines also need to be reduced as histamines stimulate the ovaries to produce more estrogen. Women with the MTHFR gene mutation often have issues reducing histamine in the body, so again they need to ensure their methylation pathways are working optimally. Support progesterone production – progesterone is made from ovulation, so treatment involves supporting healing ovulation as well as ensuring your body has enough of right nutrients to make progesterone including zinc, selenium, vitamin D, vitamin B6 and iodine.